My personal accounts of our day to day encounters, explorations and expeditions in and around the Kamloops area. The kids and I were puttering around this morning and I decided to pull out one of my bajillion “cooking with kids” cookbooks because I want to start a program in Kamloops teaching kids how to cook simple things and thus help out in the kitchen with those skills. My sister, is doing a program like that where she lives and I was totally inspired to do one, here. I found the coolest thing… a muffin mix that you are supposed to be able to keep in the fridge for up to a month! Sweet idea, eh? That way, when you need some muffins you just pop ’em in the oven. I think it’s a great idea, except that once I went to all the trouble of preparing the mix, I wasn’t about to leave it untasted… so we ended up making a double batch and now I only have one more batch in the fridge. Ah well, such is life. Here they are, courtesy of “Cooking Wizardry for Kids” and a little bit of modification on my part. Elizabeth is a Kamloops lifer. Born at RIH, she is happy to be raising her family here. Married with four wonderful children, Elizabeth is also teacher and enjoys working with parents as she learns more about this “Mommy gig”. Elizabeth is passionate about parenting and enjoys networking with other parents. 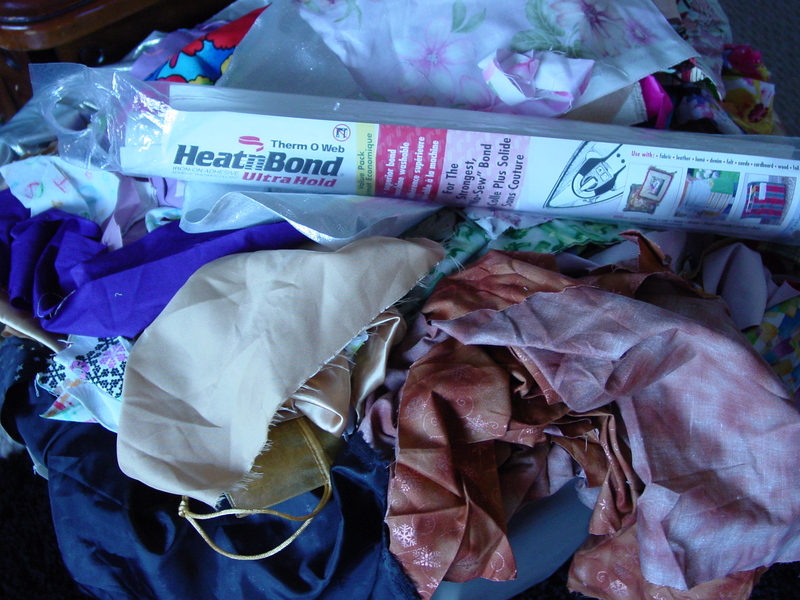 1) Pull out fabric scraps and heat ‘n bond adhesive and poly-fill. The other day, I was browsing some blogs, as I tend to do, and I came across the coolest new (well new to me, anyhow) recipe for play dough! My two big kids and I made it and had a great time playing with it (read: it was all over the kitchen floor)! Boil on the stove on medium heat (will bubble a lot because of the baking powder and water reacting – so fun!) until it starts to thicken. Then, I kneaded it until it was a little cooler for the kids to play with. After we shaped it and smashed it and rolled it and played with it for a while (read: after a while the kids lost interest but I didn’t), I put my littlest man’s footprint in the dough, made a “pizza”, made some animals and then baked them all (300 degrees for an hour) to harden them a little. I think we’ll paint it tomorrow! Now, we play with cornstarch and water all the time to create that lovely “thixotropic” (not quite liquid but not quite a solid) muck we all love. We also love making “goop” with white glue, borax and water. But this? This is awesome! It’s whiteness is totally like snow. It’s so soft and yet has that gritty cornstarch feel. I’d love to add some sparkles next time and see what I get! I really really like it. And the real bonus… it’s a great process to watch as the chemical reaction occurs while you boil it. The other day I was in the fabric store picking out some fabric for a custom apron that I had been asked to sew. Well, when I was there I saw the perfect fabric to make a twirly skirt for my 2 yo daughter. I was reading Captivating, at the time, and thought that a perfect little sparkly twirly skirt would be a great gift for my little woman. So, I made one up and here is my tutorial. Please excuse the photos. I’m afraid that I have not yet had my camera fixed and I am really missing it. While my Sony was top-of-the-line when I got it… that is now eight years ago! 1) I figured that for the length I wanted I could just fold the fabric in half and cut my strips from there. So, I folded the fabric in half lengthwise and then cut along the fold so that I had two pieces the same size. This morning I was feeling a little sorry for myself and in a bit of a 39-weeks-pregnant-messy-house-fighting-a-cold funk. After my daughter went down for her nap, my four-year-old and I pulled out some books to read, together. One of his choices was this: We’ve read it a number of times and had seen that there were instructions, in the back, on how to make your own pig! H is in a stage where he wants to “make” everything that he sees, and “build” all kinds of diggers after reading our digger books from the library and so this fit perfectly. I thought I’d break out of my feeling-sorry-for-myself funk by trying a little crafting with him.Here are the instructions to make your own pig (or whatever it ends up being).